At a special New York Comic Con event, Square Enix held hands-on demos for the first DLC challenge tomb of Shadow of the Tomb Raider, The Forge. 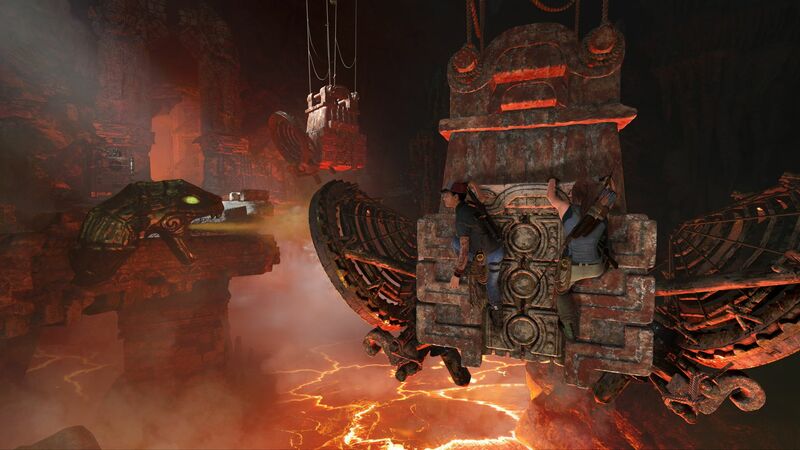 Those demos included the tomb’s co-op play, which is a weird way to go about tomb raiding considering what we’re all used to from the Tomb Raider series. That said, it’s incredibly enjoyable to do. Playing around in tombs with friends is something I never really expected to be able to do in a mainline Tomb Raider game, and yet, here we are. The first co-op challenge tomb for Shadow of the Tomb Raider is pretty tricky if you don’t know what you’re looking for, at first. And there are even several paths you and your co-raider can take. Between the multiple paths and the three different co-op modes available, there’s plenty of replay value to the DLC tomb, and that is absolutely key for something you’ve paid extra for. While the DLC pack comes with the usual perks for Tomb Raider DLC – a new skin for Lara, a new weapon, new ability, and a new challenge tomb – it also comes with a new feature. Because co-op tomb raiding is a thing now, communication tools were necessary to implement into the game. So you can either use VOIP chat or pop down markers to tell your buddy to go to interact with a specific object or go to a specific location by dropping markers the way you’d shoot an arrow. Just, instead of firing the arrow, you drop a marker where the firing reticle is. The marks aren’t the most sophisticated communication tool, but they’re serviceable. That said, you really do want to be able to communicate, because being able to chat with your partner is super helpful. I initially ran the co-op tomb twice with a member of the [user_id]Shadow of the Tomb Raider dev team, and even that was a bit tricky to coordinate. While we were better the second time around, because I’d seen everything a few times by then, it still wasn’t flawless. And that was me being paired with someone who helped build the challenge tomb. But if you’re up for a challenge, the co-op modes are definitely worth trying. Shadow of the Tomb Raider is available now on Xbox One, PC, and PS4. The Forge DLC launches November 13th, 2018 as both an individual purchase and as part of the Season Pass.